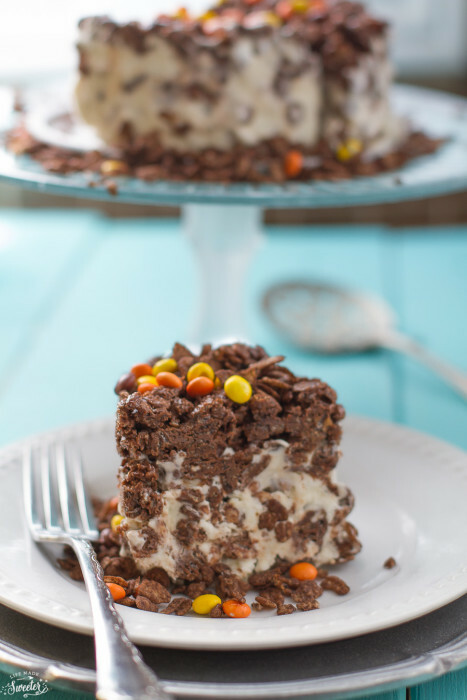 Peanut Butter Chocolate Crunch Ice Cream Cake is the perfect no bake summer dessert! 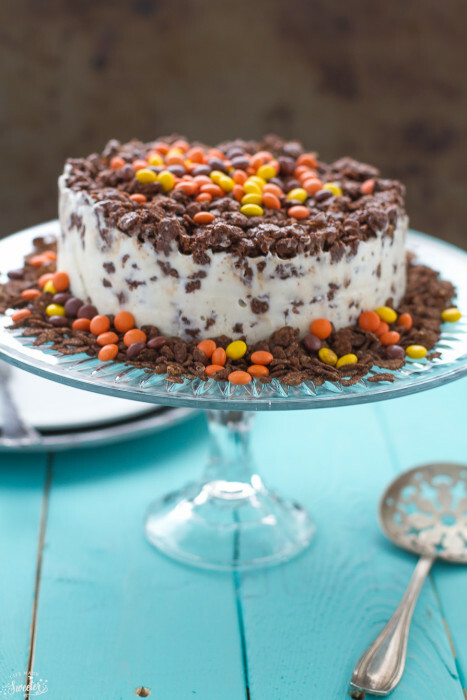 This easy ice cream cake is made with Reese’s pieces, vanilla ice cream, melted chocolate, peanut butter, and chocolaty rice cereal. I have the biggest weakness when it comes to ice cream cakes. 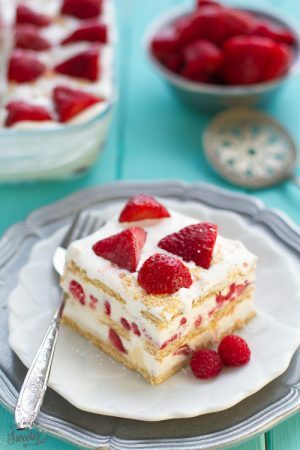 They are my favorite cakes to make during the summer when it’s too hot to turn on the oven. Plus you can’t beat how easy they are to put together and they’re always a hit with kids and adults. I’ve seen a few different versions of an ice cream crunch cake around the web and and first tried it when I made my Mocha Coffee Crunch Ice Cream Cake. It was seriously the easiest cake that I’ve ever made so I decided to make a new version with Reese’s and you know what? It was even better!! Plus, the best part about this is, you only need 5 ingredients. So simple! It starts off with your favorite vanilla ice cream, a crispy chocolate rice cereal like Cap’N’Crunch, Cocoa Pebbles or Chocolate Rice Krispies and melted chocolate with peanut butter. If you can’t find chocolaty rice cereal, feel free to use regular crispy rice cereal instead. We combine the cereal with melted chocolate and peanut butter and toss it in the freezer to firm up. Then let the vanilla ice cream soften on the counter until it is nice and melty then we stir in the chocolate coated cereal. The mixture gets spread evenly into a springform pan then we top it off with some more of the coated cereal mixture. Then we pop it into the freezer for at least 4 hours or overnight so that it can set up. When you’re ready to serve, just sprinkle on some Reese’s pieces. 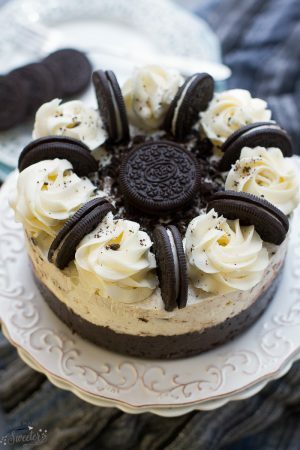 This cake is so simple and perfect for feeding a crowd without having to put in much effort. 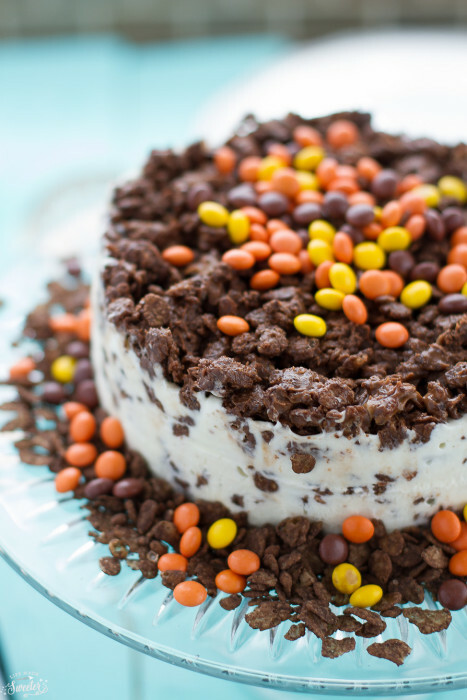 This easy ice cream cake is made with Reese's pieces, vanilla ice cream, melted chocolate, peanut butter, and chocolaty rice cereal. On the stove-top or in the microwave in a heat-safe bowl in 30 second increments; melt semi-sweet chocolate and peanut butter together until smooth. Add the rice cereal to a large bowl and pour melted chocolate / peanut butter mixture and stir to coat. Line a cookie sheet or large flat plate with parchment paper and spread the coated cereal on top. 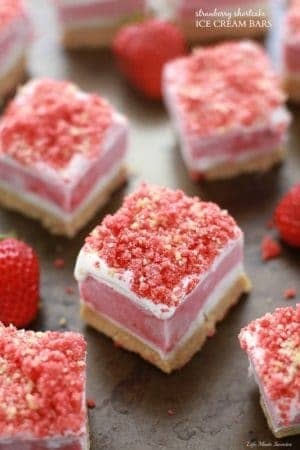 Place in the freezer to harden (about 30 minutes) then remove and break cereal into small bite sized pieces. Meanwhile, remove vanilla ice cream from freezer and place on counter to soften. Mix the softened ice cream with 1 1/2 cups of coated cereal. Pour into a 6-inch springform pan spreading evenly. Sprinkle with the remaining crunchy cereal, and press down. Place pan in freezer for 4-6 hours or overnight to harden and set up. When ready to serve, remove cake from the freezer. Use a slim paring knife run around the edges of the springform pan and then remove the sides. Place on your favorite serving plate and top with Reese's Pieces Candy and more cereal if desired.